The Secret History meets Cruel Intentions in a dark, suspenseful novel about friendship, jealousy and obsession. A violent death. Two charismatic siblings. A young, naive woman, inexplicably drawn to the brother and sister pair. Fifteen years later, a reunion with life-changing consequences. Olivia is introduced to Rufus by his sister Renée, feeling that she’s part of a game she does not know the rules of. Soon, Olivia is enthralled by Satyricon, the group of students who spend their time drinking and discussing art, literature and erotica in Uppsala’s opulent university quarter. Fifteen years later, a fortieth birthday party reunites Olivia with her old friends from the past, evoking memories of Renée and her brother Rufus; the parties; the arguments; the chaos; the pleasure. And the catastrophe. The siblings still have a hold on Olivia, but the spectre of the tragedy that drove them apart all those years ago looms large, and with it the reminder that one of them is missing, never to return; the secret that threatens to finally destroy them all. 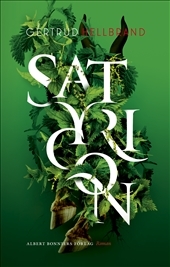 SATYRICON is a whip-smart, pacy and darkly suspenseful novel about human nature’s deepest driving forces and the eternal quest for love, sensuality and acceptance.